Free Printable My Little Pony Word Search. Free Printable My Little Pony Word Search for kids. Great activity for all the girls and kids that loves the TV animated series, toys and movies of My Little Pony. Before you see the next My Little Pony episode have fun with this activity and find your favorite characters and words from My Little Pony. Share it with all the My Little Pony little fans, parents, neighbor, teachers and friends. Find names and characters from My Little Pony like Ponyville, Aloe, Rainbow Dash, Applejack, Spike, Lotus Blossom, Fluttershy, Equestria, Sweetie Belle, Pinkie Pie and more. This easy word search includes 12 words and the answers on page 2. 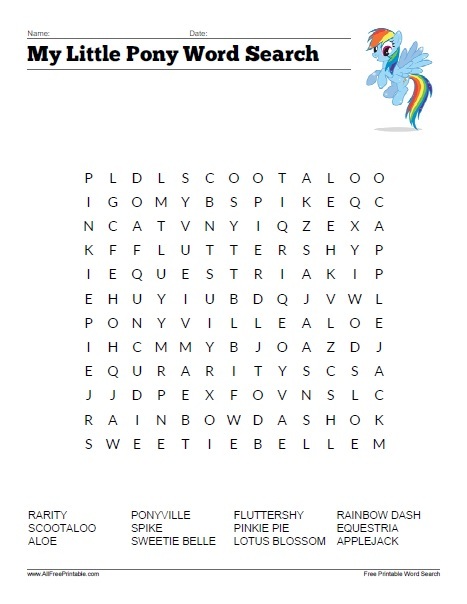 The My Little Pony Word Search Puzzle is ready to print in PDF format.